Inflation has been affecting economies all around the world, and people are highly affected due to it. However in a country like India, where most of the people fall under the Below Poverty Line, surviving in this inflation is tough. Keeping in mind of this situation, the Indian Government has started providing subsidies in commodities which form the necessities of life in India. One of these is the subsidy on LPG. LPG being a mass product is one of the worst affected commodities in inflation. However, since it forms to be the most important product in Indian households, Government notes that the people can avail it at the market price. So, LPG users must be aware of the fact that the Government of India has launched the Direct Benefit Transfer for LPG Scheme. According to this, people living in India can avail the LPG cylinders at a market price only. The subsidy that Government provides will be transferred to the user’s Bank Account. The only requirement to avail this service is that you need to link your Aadhaar Card with your Bank Account. If you have not yet linked your gas connection to your Adhar number and Bank account, please do it at as soon as possible. This is one of the best initiatives by the Government so far.Want to know what this Direct Benefit Transfer scheme is? Are you confused how to link your Aadhaar Card with your Bank Account? Well, follow this article to find out more. The Direct Benefits Transfers for LPG (DBTL) is also known as Pratyaksh Hanstantarit Labh (PAHAL) Scheme. This was launched on 1st June 2013 with an aim of covering 291 districts of the India in the first phase. The scheme has been re-launched in 54 districts on 15th November 2014 in the 1st Phase. The scheme was then launched in the rest of the 622 districts of the country on 1st January 2015. During the scheme’s launch for rest of the Indian districts, the name of the DBTL scheme was changed to PAHAL by the present ruling government of India. This scheme was launched for more than 15 crore consumers who were spread across the 676 districts of the country. Consumers who want to join the scheme will have to link their Aadhaar Card number to their bank account and also to their LPG consumer number. Though this is the preferred way, if a consumer does not possess the Aadhaar number, then he can link his bank account directly with the 17-digit LPG Consumer Id number. Once a Consumer joins the PAHAL scheme, he will get the LPG cylinders at market price and will receive his/her LPG subsidy directly in his/her bank account. An amount of Rs.568 will be paid in advance to the consumer by transferring it to the bank account, who has now joined the scheme. As soon as he files the first booking for an LPG cylinder after joining the scheme, the money is transferred to ensure that he has the extra money required to pay for the first LPG cylinder at market price. This is in addition to the subsidy that is paid on each cylinder. Camps are being held up at various banks, and LPG distributor’s premises to aware LPG consumers to open a bank account and enrol for the Aadhaar card if they want to avail the subsidy on LPG by joining the PAHAL scheme. According to this scheme, LPG consumers who have linked their connections to their Aadhaar cards and bank accounts will have to purchase their gas cylinders at market prices. The difference between the market price and the subsidised rate will be directly transferred to their bank accounts through the linking of the Aadhaar number to the LPG consumer number and bank account or directly to the account without any Aadhaar number in between. LPG users will get a three-month grace period during which people who have joined the PAHAL scheme will get the subsidy transferred in their bank accounts. People who have not yet registered will continue to get their cylinders at a subsidised rate. Even after the three-month grace period, people who do not join the scheme will be eligible for an additional subsidy period of another three months during which they will get LPG cylinders at the market price. They will get the due subsidy credited to their bank account once they enrol for the scheme during this period. However, after this tenure, consumers who have still not joined the scheme will see this subsidised amount getting lapsed and will have to avail cooking gas at the market-determined price. Once they join the PAHAL scheme, they will be able to enjoy the subsidy with prospective effect. Thus, all LPG consumers who are yet to join the scheme must do so quickly. People who do not have bank accounts yet must first open bank accounts and then submit the required details to their LPG distributor and Bank for becoming cash transfer compliant. To keep the LPG consumers updated and informed about their status in the scheme, consumers will keep receiving SMS at every stage in the scheme. To avail this feature, all LPG consumers are requested to register their mobile number with their distributor immediately if they have not yet done so. They are also advised from the authority to receive cylinders only with cash memos so that they are assured of their subsidy transfer. If you are an LPG customer, then you are entitled to get the subsidy directly to your bank account under the DBTL scheme. Once you join the DBTL scheme, you will get the offer of permanent advance. Once you make you book a cylinder for the first time after joining the scheme, the payment will immediately transfer to your bank account. The consumer who opts for the DBTL scheme gets the benefit to avail the subsidy directly from their bank account which is known as “Cash Transfer Compliant”. If you want to avail direct subsidy, then you need to have an Aadhaar Card which you can link to your bank account. The government has also announced that consumers can get subsidy without linking their Aadhar Card too. In each of the cases, the process is different. You will find the process below. How to register LPG subsidy with your Aadhaar Card? As I mentioned above, there are two ways in which you can implement the process. You can connect your bank account to the respective LPG Gas connection and Aadhaar number. Click on Start Now button and follow the steps below. Step-1: Link Bank Account to get LPG Subsidy– Here you have to enter your address by selecting the State and district you live in. Select the benefit type as LPG. In the second box you will see that under the name of the scheme, you will have the name of the three oil companies in India, like- BPCL, HPCL, IOCL. Now select the name of your LPG Distributor from the drop-down box below. Put the Consumer Number as provided by the LPG distributor. Your consumer number will be mentioned in the LPG card/booklet. Once you enter the number, your name will appear in the box next to it. You will now receive a 4-digit OTP. Step-4– To link Bank account with LPG– Enter this OTP in the OTP box and put the CAPTCHA. Step-5– To Link Bank Account with LPG– Click on Submit now. How to register your LPG Gas without Aadhaar Card? It is true that Online process is the best. However, many people live in places where Internet has not yet reached. Some people are not yet Computer literate. So, since the Government is for all, such LPG consumers can apply through offline too. You can use the offline method too to get the LPG subsidy without linking to the Aadhaar card. Download the Aadhaar Card form no. 4 from the official website. After downloading, take out the print of the form. Visit the distributor office and submit it. Make sure that you get acknowledgement slip. 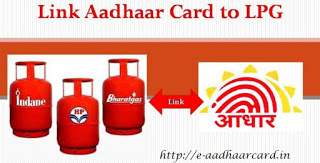 Hurry up and start linking your Aadhaar Card to avail LPG subsidy now!